It must be nice to have a little juice in this Hollywood movie making business. 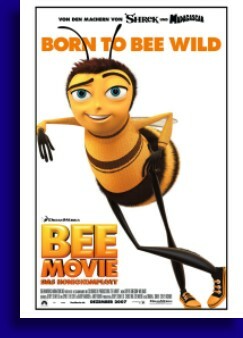 As the story goes, Jerry Seinfeld had and idea, just an idea mind you about an animated movie about bees. So he calls his good friend Steven Spielberg and before you can say ‘Chutzpah’ I’m sitting in a theater watching an animated movie about bees, cleverly titled ‘Bee Movie’. Amazing. Barry B. Benson (Seinfeld) and his good friend Adam (Matthew Broderick) are about to graduate from the Bee University and are quite excited to see what the future holds for them. Barry becomes a little less enchanted about his future when he finds out that the job he chooses will be his position for the remainder of his life. Aw, it ain’t all that bad Barry. The Bee Jocks seem to be the ones having the most fun since they are the ones who actually get leave the hive and experience the world beyond the hive. Barry manages to cajole his way into the Bee Jock squad to find out what life outside the hive is all about. As circumstances would have it, Barry gets separated from the squad and lands in the apartment of one Vanessa (Rene Zelwegger) who after saving Barry’s life from being smashed by her boyfriend Ken (Patrick Warburton) and surviving the shock that Bees can talk, the pair become fast friends. On a fateful trip to the supermarket with Margo, Barry discovers jars and jars of honey, knowing how difficult it is to create honey, he is outraged at that these humans have honey and wants to know how they got it in the first place. Once Barry discovers the existence of the inhumane (inbeemane?) bee farms, he decides to sue the human race. Well the results of Barry’s lawsuit against the bee honey industry had ramifications that even our busy little bee could not fortell leaving Barry and Margo in a race against time to essentially save all of humanity. But not necessarily save beemanity because It seems that we serve very little purpose in the life of bees. Written and produced by Jerry Seinfeld there are a lot little clever bits in this film which is filled with Seinfeld’s off beat humor of observance. Why insects continue to smash into closed windows and fly into light bulbs can now finally be revealed. As one would expect from an animated film of this magnitude with the outstanding amount of talent involved, the voice acting was spot on flawless. I also enjoyed the way the filmmakers constructed the bee hive in a real world way that was very clever. I would be quite remiss in my duties as an unpaid film critic not mentioning Ray Liotta’s inspired guest spot as the voice of Ray Liotta. Hilarious. So with the top notch animation, the great voice acting, the trademark Seinfeld humor, the clever little story line with an inspired narrative what actually could be wrong with ‘Bee Movie’? Not much, other than the fact that it’s just not as funny as one would hope it to be. It’s certainly an amusing film from start to finish, almost guaranteed to keep a smile on your face throughout its duration; it’s just not an inspired movie, say like the best from Pixar studios. I don’t have nearly enough talent or ability to advise a studio how to do it like Pixar does it, or do I even have enough awareness to know what makes a Pixar movie great and something along the lines of ‘Bee Movie’ simply okay, but I am aware of the emotion that a work is able to glean from the viewer and that’s another thing that is missing from ‘Bee Movie’. Though you don’t want anything bad to happen to Barry B. Benson in this film, you really don’t find yourself rooting for him all that much either, which again leads us to the emotional detachment that one feels while watching this movie. As I observed my eleven year old son while watching this film, it seems he felt the same way as the movie was able to hold his interest, but didn’t have him chatting up the movie after it was over, say like he did after seeing ‘Cars’. I still found ‘Bee Movie’ a cut above a lot of the 3D animated films recently released, say like the latest ‘Shrek’, which I could barely tolerate or ‘A Sharks Tale’ and others just to name a few. And not being as enjoyable as a Pixar animated film doesn’t make a film poor, it just makes it a cut below. So while Jerry Seinfeld’s ‘Bee Movie’ is certainly a bit below the best the genre has to offer, it still is reasonably entertaining and a film I still find myself recommending.